The following is an article about the WPA mural done by Richard Hay Kenah for the Park Road School in Ambridge. 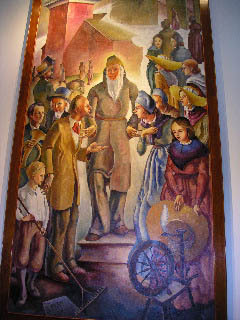 "This is one of three murals painted in 1934 by Richard Hay Kenah for the auditorium of the old Ambridge High School at 740 Park Road, now the Ambridge School District's administration building. The other murals for the high school display parts of local history. One shows a map of George Washington's travels through the Ohio Valley with images of Washington, his guide Christopher Gist, and Tanacharisson, a Seneca chief. The other mural, now lost, depicted the growth of the steel industry in Ambridge and the Ohio Valley. Kenah, a New Brighton, Pennsylvania native, graduated from the Art Institute of Chicago in 1932, but could find no work during America's Great Depression. Kenah family history states that he applied for a position as an artist with the Federal government, probably with the newly formed Civil Works Administration (CWA) which briefly funded the Public Works of Art Project (1933-1934). He built a studio on Dutch Ridge Road in Brighton Township and completed the murals there. 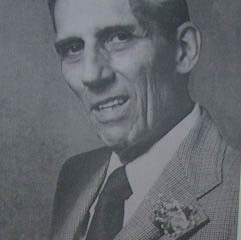 He later worked for the Army Quartermaster Corps during World War II, after the war organized the exhibitions division of the Geological Survey and in 1967, received the Distinguished Service Award from the U.S. Interior Department. He retired in 1970 as head of the exhibits division of the U.S. Geologic Service in Washington, DC. After the Park Road School closed, the building was turned into the Administration Building for the Ambridge Area School District. The auditorium turned into a storage and boiler room, but the paintings remained. In 1999 the School District donated the mural to Old Economy Village. In September of 2002 the Commonwealth Conservation Center removed the Harmony Society mural. Because it was attached very securely to the plaster walls, the conservators carefully chipped away the plaster with air chisels. Weighing 500 pounds, the mural, with attached plaster, was transported to Harrisburg. There, the tedious work of restoration began-cleaning off layers of plaster, discolored varnish, wall paint, coal dust, and-taking more than 1000 man hours to complete."